I’m a chips & dip girl all the way. Always have been, always will be. I can’t even keep chips in the house because once I start eating them, I can’t stop. I try to only buy them when we’re having company which is also when I most often make this salsa. I still remember my first time eating homemade salsa. When I was in college, I went over to my friend, Deborah’s apartment. She was newly married, and her family was known for good home cooking. She served me chips and salsa before dinner, and it was some of the freshest-tasting salsa I’d ever eaten. “Oh, I made it,” she said. Just like that. Like it wasn’t the most amazing thing in the world. Deborah nodded, shrugged and went on to tell me how. My mind was blown. She had MADE THE SALSA. Herself. In her little kitchen. 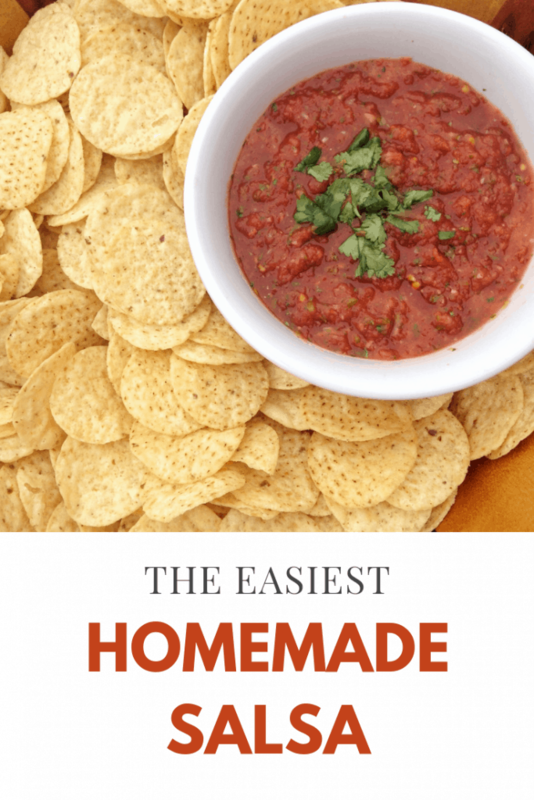 I didn’t even know it was possible to make homemade salsa! I ate a lot of Pace Picante Sauce and other jarred salsas, and I knew that the salsa in Mexican restaurants was better than those jarred ones. It never even occurred to me, though, that you could make restaurant-quality salsa at home. Once I realized how easy it was, I never looked back. Now I’m the one making the homemade salsa, and my dinner guests are the ones saying, “You made the salsa?” In fact, just a couple of weeks ago, we had several teens and their parents over, and one of the moms was amazed at this homemade salsa. “You made this? I could drink this salsa, it’s so good!” she said. Once you see how easy it is to make your own homemade salsa, you’ll never need (or want!) to buy it from the store again. This salsa tastes like it was a lot of work, but seriously couldn’t be any easier to make. Want to know how to make it? Just throw all the ingredients in the blender and blend until smooth. That’s it! I even save you the trouble of taking out the seeds and membranes of the jalapeño (to keep things simple and to save your fingers from any burning). Just cut off a one-inch piece and toss it in with the other ingredients, and you’re good to go. You’ll be so proud of yourself for making homemade salsa, and your guests will be impressed. Enjoy! Pulse until the salsa is the desired consistency. Add as much or as little jalapeño as you'd like. I just cut off a 1-ince piece without messing with the seeds or membranes. 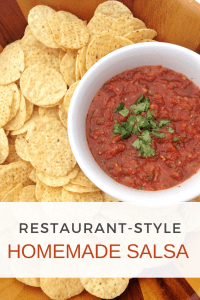 This is the easiest salsa recipe I have seen and it looks delicious! I will have to try this in the summer with our tomatoes from our garden! It is ridiculously simple for how good it tastes. Let me know what you think! Oh wow, this is so simple! I can eat salsa by the gallon, but I never thought to try making it myself. Is it ok to omit the cilantro? Or maybe substitute another herb? I have omitted the cilantro before, and it’s still pretty tasty. You could try subbing in parsley! I wish there was more images!! would love to see the progress of each step. I don’t have great light in my kitchen, so I can’t take a lot of process photos. But the only steps are literally to throw everything into the blender and then turn it on! 🙂 Thanks for the comment! This looks so simple and so delicious! I can’t wait to try this on my next taco night! I had never thought of just chopping off a piece of the jalapeno and throwing it in! I almost always leave jalapeno out because I don’t like messing with slicing and seeding it. Great tip! I love salsa! Thanks for sharing your recipe at the Merry Maids linky party! 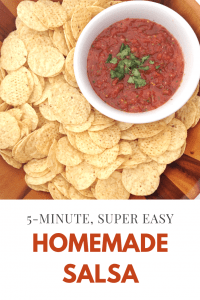 chips and salsa is one of my favorite snacks…this looks so good!